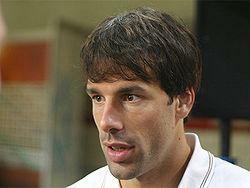 Read the news about the retirement of Dutch footballer Ruud van Nistelrooy. Nistelrooy announced his retirement from professional football on Monday. He was the player of Spanish club Malaga this season. He is the 2nd highest goal scorer in Champions League. Dutch footballer Ruud Van Nistelrooy, one of the best forwards in the world, has retired from all forms of professional football. The 35 years-old has been playing for Spanish club Malaga this season. Nistelrooy declared the retirement on Monday at Madrid. He had retired from international soccer one year ago. Nistelrooy is the second most prolific scorer in the UEFA Champions League with a tally of 60 goals. He is retiring after earning Malaga the qualification for the Champions League for the first time in history of the club. Nistelrooy started his career in local club Den Bosch in 1993. Then he was recruited to the frontline Dutch club PSV Einthoven. He scored 62 goals in 67 matches for the team. Then he reached English super club Manchester United in 2001. He scored 95 goals from 150 matches in the Premier League. Nistelrooy's scoring brilliance was noted by Spanish giants Real Madrid and they bought him in 2006. Nistelrooy continued his form and netted 46 goals from 68 matches in Real Madrid jersey. Then he started losing form and was sold to German team Hamburg in 2010. He joined Malaga this season. He has scored a total of 347 goals from 589 games in club career. He won 2 Dutch Leagues with Eindhovan and Premier League, FA Cup , League Cup and FA Community Shield with United. The Spanish League crowns of 2007 and 2008 with Real Madrid are his other achievements. He was topscorer in 3 seasons of the Champions League as well. Nistelrooy wore the Dutch jersey 70 times and has scored 35 goals for his country.